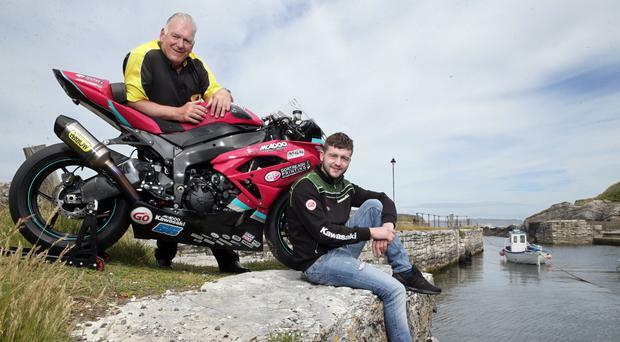 The Armoy Motorcycle Road Racing Club officially launched the 10th Anniversary Bayview Hotel Race of Legends yesterday and they hope to mark the milestone in style. The event will take place during the last weekend of July with a host of local and international road racers expected to pit their skills around the picturesque three-mile circuit in north Antrim. Clerk of the Course, Bill Kennedy MBE, explained: "John McGuinness, a 23-time TT winner, will be attending the Armoy Road Races for the first time this year. "McGuinness will be bringing his merchandise to the national road race and engaging with his fans in Northern Ireland. "He is a great fan of Joey Dunlop and the Armoy Armada, and we will ensure that, even though he will not be racing, he will be given a very warm Armoy welcome. "There is a lot of expectation considering we are celebrating a very significant milestone and I have no doubt that it will not disappoint. "Race entries do not close until Monday, July 2, and with the Isle of Man TT just finished many riders are only now turning their attention towards Armoy." The Armoy Club was formed in 2007 with the intention of holding a race in the area of the legendary Armoy Armada -Joey Dunlop, Mervyn Robinson, Frank Kennedy and Jim Dunlop - who set road racing alight in the late 1970s in their battles with the Dromara Destroyers -Ray McCullough, Ian McGregor, Brian Reid and Trevor Steele. Armoy is, of course, Dunlop territory and Michael, a triple TT winner a few weeks ago, has an outstanding record on what is home ground for the 29-year-old. He has won a record 17 times at Armoy and holds the outright lap record of 106.812mph, set in 2013. He has won the last seven Race of Legends - in fact, the only other winner of this feature race was Ryan Farquhar in 2010 (the very first Race of Legends in 2009 was abandoned following an accident).